The Cord Reel with 4 Outlets provides 20ft extension cable for powering indoor electrical equipment. 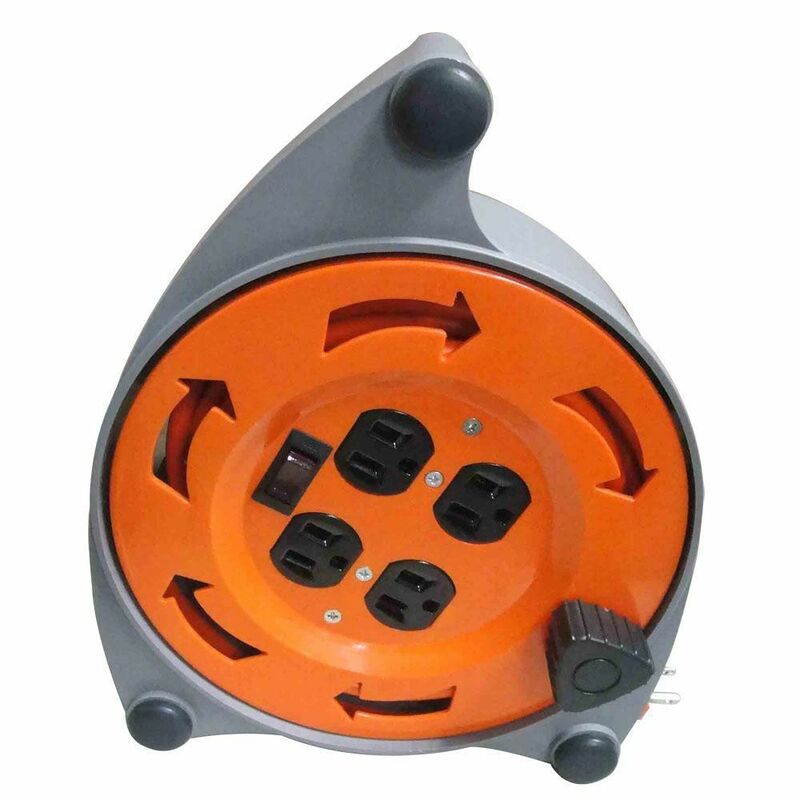 This cord reel is equipped with a lighted reset/off switch and 4 integrated grounding outlets. Self-storing extension cord allows up to 4 tools or appliances to be plugged in either indoors or outdoors. The Globe Electric 6-Outlet Grounded Surge Protector Power Strip with Circuit Breaker Switch and 2 USB Ports brings you additional outlets to provide required electricity with added USB ports to charge your hand held devices. Being surge protected for up to 1800 joules, it is the perfect strip to use with small appliances and electronics such as lamps, computers, printers, smartphones, tablets and home theatre systems. Save power consumption with the handy lighted circuit breaker switch. The 3-foot power cord gives you the added convenience of increased range from power outlets. Comes with a manufacturer's warranty protecting up to $200,000 on connected equipment for the lifetime of the surge protection function. Recommended for indoor use. This HDX 100ft 16/3 Orange Extension Cord is specifically engineered for applications such as powering tools and portable lights. This extension cord comes with a 3-prong grounded plug and outlet for additional safety during application. It is made with durable vinyl jacket that resists abrasion, moisture and prolonged exposure to sunlight and are sturdy enough for both indoor and outdoor use. This cord also features added length for flexible and versatile use. 4-Outlet 16-Gauge Cord And Reel The Cord Reel with 4 Outlets provides 20ft extension cable for powering indoor electrical equipment. This cord reel is equipped with a lighted reset/off switch and 4 integrated grounding outlets. Self-storing extension cord allows up to 4 tools or appliances to be plugged in either indoors or outdoors.